"A 73-year-old lady presents to the Emergency Department with a three-week history of a dry cough, intermittent wheeze and one episode of frank haemoptysis." Her past medical history includes high blood pressure and anxiety. She has been on a calcium-channel blocker for many years but doesn’t take anything else. She stopped smoking 8 years ago, but prior to that, smoked 20 cigarettes per day for 50 years. Her obs are within normal range and her bloods show an elevated WCC at 13, but nil else. 1. What signs would you look for on clinical examination? B: Assess work of breathing, chest expansion, percussion, resonance and auscultation. Check sats and respiratory rate. Check for lymphadenopathy and clubbing. C: Check pulse, blood pressure, capillary refill, patient’s general colour. Listen to heart sounds. E: Fever? Any bruising or non-blanching rash? Check no palpable liver or spleen. Look for clinical evidence of DVT. 2. Based on this clinical information, what is your differential diagnosis? 3. What does the X-Ray show? There’s opacification next to the right hilum. This could be consolidation secondary to pneumonia or an underlying lung carcinoma. 4. How would you manage her? Calculate CURB-65 score: (Confusion, Urea >7, Respiratory rate >30, Diastolic blood pressure <60, Age>65). 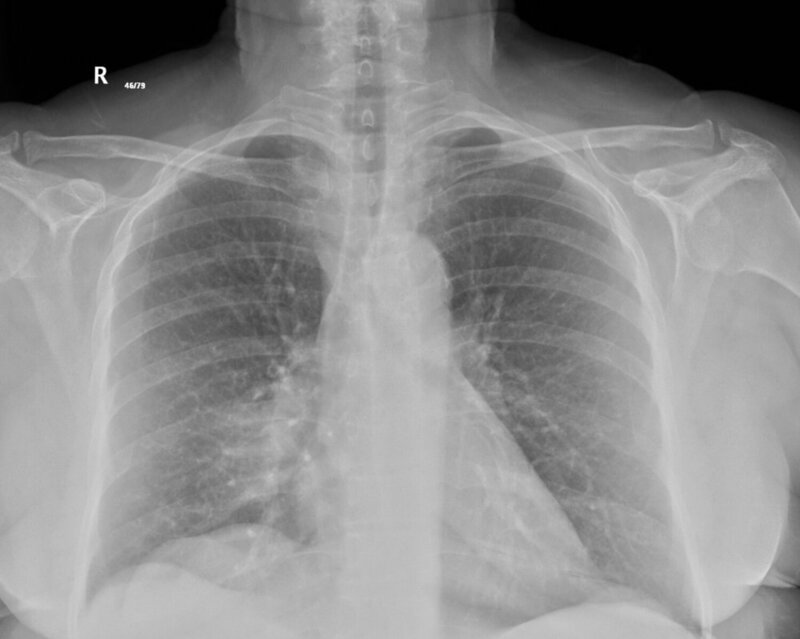 If 1 or less, it would be reasonable to commence oral antibiotic treatment and discharge to the care of the GP, with a letter indicating that the patient will need a repeat CXR (often in about 6 weeks time) to assess for resolution of the consolidation. She may have underlying COPD and should be assessed from that point of view. Advice to the patient would also include the need for a repeat CXR, but also safety net advice – if things get worse, come back. Alternatively, the patient could be transferred to GGH – but does she really need an inpatient admission? Or, her care could be discussed with the respiratory registrar on-call to see if an urgent outpatient appointment could be arranged. 5. What do the NICE guidelines recommend in a patient like this? NICE give no direct guidance on haemoptysis. However, two guidelines may be relevant to this patient. The NICE guideline on referral for suspected cancer suggests that a patient with haemoptysis and an abnormal CXR needs an urgent referral. The bottom line is that haemoptysis is a ‘RED FLAG’ symptom and follow up should always be arranged when seeing these patients in ED. This unfortunate lady received no follow up and was diagnosed with lung carcinoma some 9 months after her first ED visit. The reasons for the late diagnosis were investigated as a serious incident, the report for which is also included in this module.